In the spirit of Earth Day last week, I wanted to talk a little about some green energy sources. Not because I think the earth has a temperature and I feel we owe it to her to reduce our carbon footprint, but because in all the research that I’ve done, so called green energy sources are most conducive to long term personal or family energy sources. Sure anyone can buy a gas generator but it only provides energy as long as the gas holds out. Since gas degrades over time, in a TEOTWAWKI world after several months gasoline will gum and drop octane, making gasoline generators a poor long term alternative energy source. Considering how 90% of modern American electricity is produced in power plants using a type of fossil fuel to create steam, which is used to turn a turbine, thus creating the electricity. Since the process takes place on such a massive scale, the burning of the fossil fuel becomes not only cost effective but actually cheaper than most other forms of electricity production. The problem with producing electricity for your household in this manner is that due to the small amount you’re producing and the cost of the fuel and equipment, it becomes very expensive. The average American household consumes almost 11,000 kilowatt/hours per month, according to Consumer Reports there are two types of home generators, portable and fixed and they are capable of producing 2,500-20,000 watts. The problem, other than the cost, is that few of these generators are designed to provide power on a full time basis. 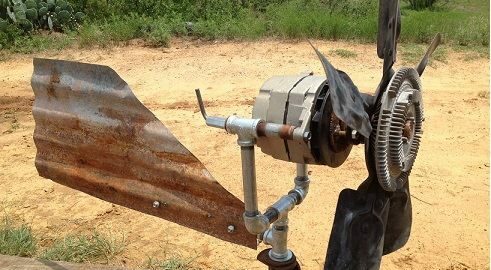 If you could replace the gas motor with another means of turning the generator, you would eliminate the cost of the fuel and the wear on the gas motor. In a perfect world it could be replaced by a fast moving stream or waterfall. Another possible replacement is wind, if you are in an area that has a perpetually strong wind. What could we use as a generator? I’m speaking here about the device that will actually create the electricity. To generate electricity through induction all you need to do is spin a magnet or group of magnets, inside a wire coil. The amount of electricity created is affected by length of wire, strength of the magnetic field, and velocity of movement inside the magnetic field. I’m not going to get into the science behind this because that is beyond the scope of this discussion. But I will give you some ideas on where you can find some generators relatively inexpensively. Before I get into suggestions on generators, let’s talk a little about power delivery. 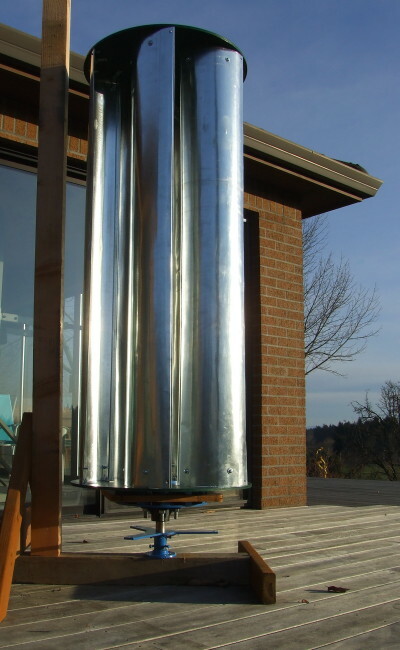 You will want a place to store your generated energy and it’s not like you can hang it on a hanger in the coat closet or put it in a box in the guest bedroom closet. A battery compartment will be required and of course the electricity you create will be stored in 12 volt batteries. Which brings us to the next part of the system you will need, a charge controller. A charge controller protects your battery, how well it protects the battery depends on the quality of the charge controller and the features that it has. If you’ve read anything that I’ve previously written, you’ll know that I’m a huge believer in layering; layer your clothes, layer your plans, layer your defenses. Why would your energy grid be any different? If you’re using wind or hydro or both, you can add solar to your grid for relatively low cost. 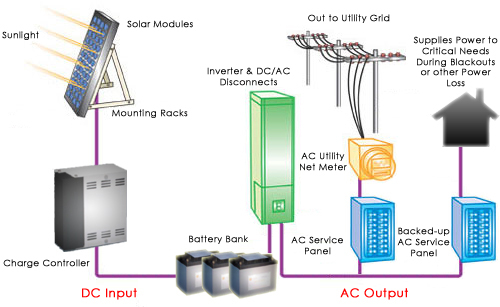 Since the batteries store DC power and your home runs on AC, you will need a sine wave inverter to convert the power from DC to AC. 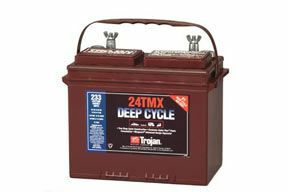 Unless you want to live completely off grid, in which case you could look into replacing all of your devices with a 12 volt DC equivalent. There are definite pluses to being off grid but there also pluses to being on grid. In fact some power companies will actually pay you for excess power that you produce. Where can you get these generators? Well we are charging 12 volt batteries, what else runs on 12 volt batteries? Cars and trucks use a 12 volt battery, and it is recharged by the vehicles alternator. 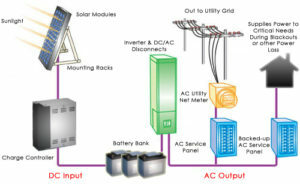 We can use air or water to turn the alternator and use the alternator to charge our batteries and 10 batteries connected in series will be 120 volts which will power most homes. If you live near the coast, you’re in a unique position allowing you to utilize resources from both land and sea. Since there have been and will be many land survival articles, I will focus on the sea aspect in this one. We’ll start with water. Of course you can’t drink seawater, until you take the salt out. So how do you take the salt out? There are 3 principle types of desalinization, electrical, thermal, and pressure. Electrical desalinization is a process utilizing an electrical field to remove the salt. It’s technical and papers have been written by universities about it. Due to its complexity it’s really not a helpful process for the average person. 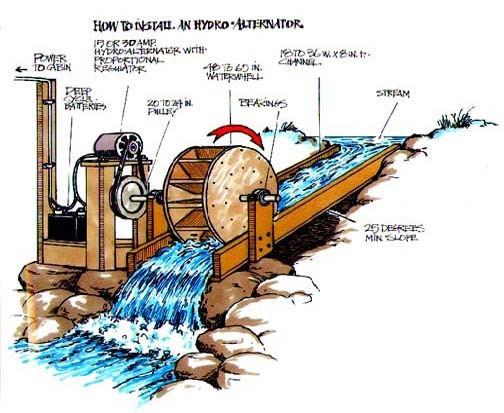 Pressure desalinization is the act of using centrifugal force to pull the salt out of the water. Thermal desalinization is the oldest and most natural form of removing salt from seawater. So natural, that it occurs by the sun everyday around the world. 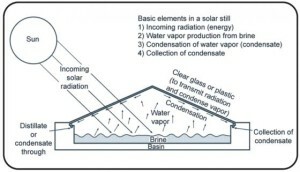 The water vapor forms clouds and then is released back to earth as rain. We can simply replicate this process a couple different ways. 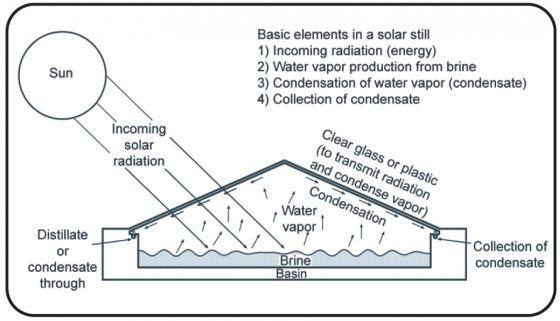 Either using a heat source and distilling the water, or utilizing the suns radiation in a solar still to evaporate the water. Shelter on the ocean is a serious problem. If you’re in the ocean, you have two serious concerns hypothermia and shark attack. Hypothermia is when the bodies core temperature falls below 95 degrees Fahrenheit. Due to water being an excellent conductor of heat, it can pull the heat out of a body, and since we lose like 80% of our body heat through our head and neck, keep them out of the water. Also don’t shed clothes, they will act as a barrier and your body will heat the water between your skin and your clothes acting as an insulation layer between you and the outside water. On a long enough timeline everyone’s survival rate drops to zero. If the water temperature is above 50 degrees Fahrenheit the danger for shark attack is elevated. The lower the water temperature, the greater the risk of hypothermia due to prolonged exposure, when exposed to cold water the Coast Guard’s 1-10-1 rule applies. The first stage in cold water exposure is Cold Water Shock, you have one minute to control your panic. Studies show that 20 percent of people exposed to cold water die in the first minute; they panic when they are first immersed, breathe in cold water and drowned. The next phase is Cold Water Incapacitation, over approximately 10 minutes you will lose effective control of your body, fingers, hands, legs and arms. You need to deal with self rescue during this brief phase because your ability to swim will become greatly reduced as time passes, if you aren’t wearing a life jacket at this point and are unable to get out of the water, the odds are pretty good you’re going to drown. The last phase is Hypothermia, you have approximately 1 hour, depending on water temperature, and physical condition until your body shuts down, you lose consciousness and die. Another thing the ocean has in abundance is food; in the form of fish, shellfish and water fowl. Since this isn’t a hunting or fishing article, I won’t get in depth into gathering food but will touch on a few gathering techniques. You can of course always fish with a hook, line and pole. But there are several ways to harvest fish without a line and hook. 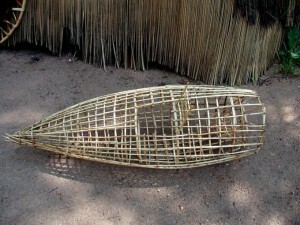 There are several different types of commercial fish trap available for purchase, but you can also make one from sticks and twine, or using sticks in the sand you can make a tidal fish trap. Making a fishing spear is also an option, it’s a little more complicated than just sharpening a stick, but still not very technical. When you live near the ocean, like coastal dwelling people throughout history, you must master the sea and to do so you’re going to need a boat. 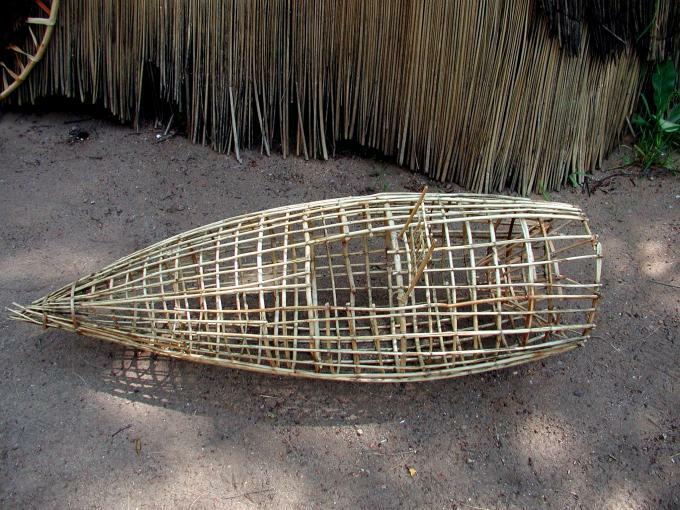 I’m going to talk about boat building next week, but will talk this week a little about some aspects of their use. When you’re standing on the beach and looking out to sea, due to the curvature of the earth, the horizon is only 8 miles away. You can see larger objects such as cruise ships or aircraft carriers out to 10-12 miles depending on their height but a small motor boat or row boat, you would be lucky to see at 8 miles. If you were sitting in a canoe or kayak out in the water your horizon would be down to perhaps 5-6 miles. This comes into play when we start talking about navigation. Whether you’re navigating on land or on sea, before you can plan where you’re going; first you must know where you are. 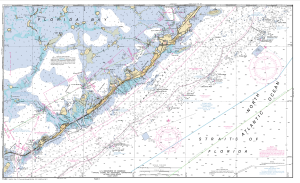 To know where you are, you need a map or chart, a compass, and a straight edge. There are a few different grades of certainty that I want to talk about. If you look on your map and find a tower, an antenna, or even a notable landmark or pier that you can see from your location; take a bearing to the object and lay it out on your map with your straight edge, what you have now is a line of bearing. Find another object that is like 50-60 degrees off from the last, and lay it out on your map, you now have an estimated position. Repeating the process and at the point where the 3 lines meet is a fix, for most of what we’re doing here an estimated position will work for what we need, if you’re navigating a deep draft ship in close proximity to shoal water, knowing your exact location is crucial, however if you’re in a row boat, and you know where you are within 100 or 200 yards, you will be fine because from there you can visually navigate to where you want to go. If you live in the mountains, you’re probably aware of the unique hazards associated with this environment. You may get something out of this week’s article but it is meant for people that are either city dwellers or live down in the flat. It will be a big help to the people of California that are trying to escape over the mountains before Governor Moonbeam builds his wall. 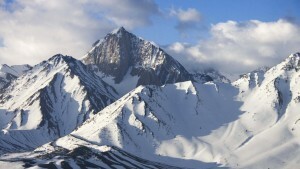 Seriously though, the effects of altitude on the body, environment and weather make mountain survival truly unique. 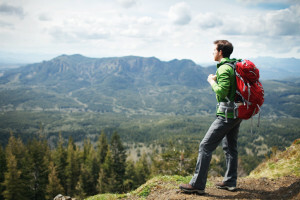 If you find yourself having to cross large mountain ranges, stick to the passes or canyons. Figuring that it would be shorter to go over the mountain, rather than around it may be true for birds but unless you’re in an airplane, it’s not so for humans. They may not look steep from a distance and even as you begin scaling them they may not seem bad, until they are. Nonacclimatized individuals rapidly ascending above 3,000 meters (9800 feet) are at risk of developing high-altitude pulmonary edema (HAPE), a life threatening condition where the air pockets in the lungs fill with liquid. 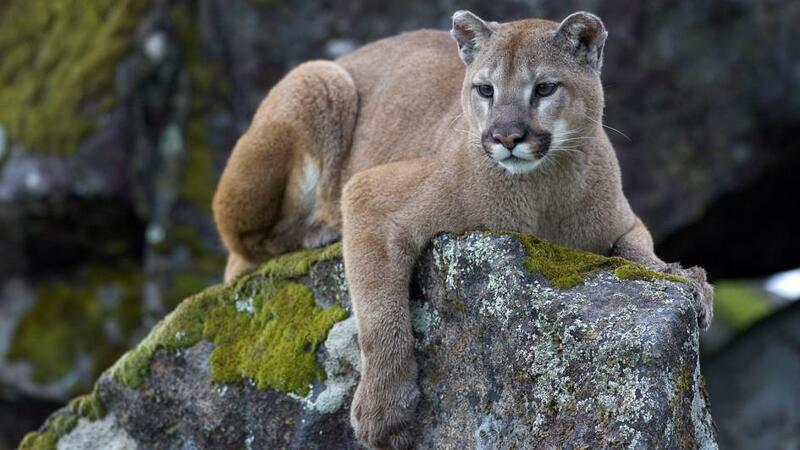 Many people are afraid of bears or mountain lions or wolves or some such animal, that they are going to be attacked or eaten, but you are far more likely to die from the elements. The mountain will kill you before something that lives on the mountain will. I will include a quick note about wild animals… For the most part they are more afraid of you than you are of them. There are very few actual man eaters in the mountains. Even grizzly bears and mountain lions would much prefer easier prey than humans. That said there’s no sense tempting fate, so when encountered give them a wide berth, but DO NOT run from them. This same advice should include ANY large animals that have young with them. You seriously don’t want to get between momma and her baby! Your food can attract animals, especially meat, so take care to keep any that you may be carrying in airtight wrapping. Temperature can be a killer on the mountain. During the spring and fall, the daytime temperature can be, depending on altitude, up in the 70’s or 80’s (Fahrenheit) but at night can still get down below freezing. So it’s very important to layer your clothes! 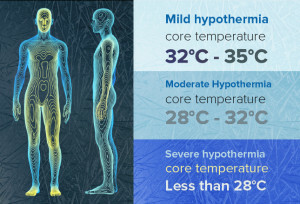 If you’ve been out hiking all day and your clothes are sweaty and wet, and then the temperature drops off fast at night you could find yourself in a hypothermia situation. Weather at high altitude can change rapidly, due in part to the more powerful and steady winds aloft. Also as water vapor forms clouds and is blown across the mountains, even if it doesn’t become a storm, due to the resulting contact with the ground, water condenses on objects making you and your gear wet. As I talk about in The Rule of 3’s, one of the first things you should think about, especially in a mountain environment is protection from the elements. Starting with your clothes, you should have at least 2 ways to stay dry, and a method of building and/or maintaining a shelter. Another concern is the need for water. The air at high altitude is very dry (when there’s no precipitation present) especially in the winter when the moisture in the air is frozen. This leads to… DON’T EAT THE SNOW! Although it satisfies the need for water, it erodes the need for shelter; in that it lowers the core body temperature and can lead to hypothermia. There is a long running myth that fast moving water is safe to drink, all ground water found in nature should be treated or filtered before consumption. There is the possibility that you will be okay drinking it, however any bacteria present could result in stomach cramps, diarrhea, even parasites. I don’t think I need to tell you that if you’re running from Governor Moonbeam’s stormtroopers, drinking bad water will really slow you down! In the United States, 80.7 percent of the population lives in an urban area, according to the 2010 census which is the latest census data available. Many of us would love to live on our own plot of a thousand acres, off grid and self sufficient or our own private island, but for most of us it’s just not a reality. When life gives you lemons, you can just be sour, or you can look at the bright side, take stock of your resources and make lemonade. If you are like me and although you would truly prefer to live on a mountaintop somewhere, but due to the circumstances you find yourself in, created by the choices you’ve made over your life thus far; your preference has to take a backseat to the realities and responsibilities of the life that you have created. Just because you work and live in an urban area, doesn’t mean you’re any more or less vulnerable than the person that lives on the mountain. In the city you don’t normally have to worry about wolves or bears, but there is the potential of human predators that can cross your path. When living in the city there are two different times of concern: everyday life and life after TEOTWAWKI. Generally speaking in everyday life, minimizing your chance of becoming a victim can be done through situational awareness, attitude, and body language. One thing about living in or near the city; if you want to protect your family and prepare for any emergency, embracing technology is a necessity. One night last May the wife and I were sitting in an upstairs room of our house that overlooks our driveway, watching a movie. 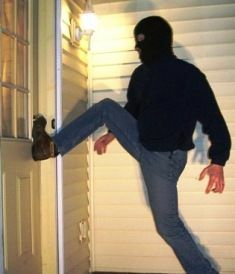 The following morning, my wife got in her car to find out it had been burglarized! They didn’t take a whole lot, just a few CD’s, a box of .380 ammo and her garage door remote. I zeroed out all the garage door codes and paired new remotes and installed a day/night vision HD security camera system. Lesson learned, no matter how nice the neighborhood, there is always the potential for theft. Another thing that I am in the process of doing is converting my home to a smart home system, utilizing the z-wave and zigby technologies as well as wifi. 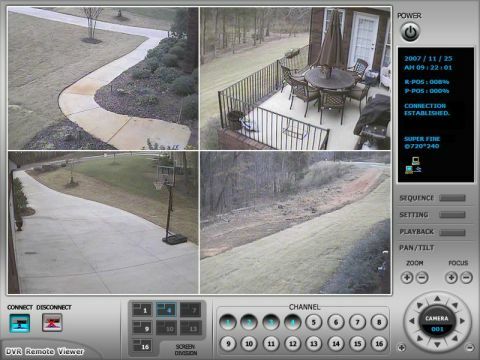 I have a hardwired security system but want the added flexibility of a wireless system. Doors, make sure all your exterior doors are solid core and deadbolts go without saying. Take the screws out of the existing plates in your door jams and replace them with 3 inch screws, do the same with the hinges. The longer screws will go through the door jam and into the double studs inside the wall on each side of the door. If the hinges face outside replace them with hinges that the hinge pins are not removable. 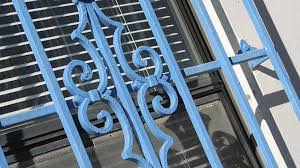 Consider installing a separate steel security door in addition to other external doors. Windows, during normal life there isn’t much you can do except lock them and have window sensors and breaking glass detectors, unless you want to live with bars on your windows. However, you can precut plywood for each of your windows. In the event of a storm or an SHTF event you will have the plywood sheets cut and labeled; use 3-3 ½” hex head lag bolts with washers to bolt them to the studs and plates inside the wall around the window opening. 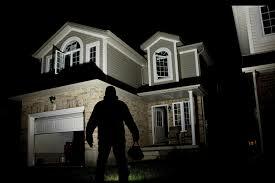 Security lights and motion sensors are a big deterrent for criminal activity. Turn on the lights and the cockroaches run for cover. Inexpensive exterior lights can be purchased with motion sensors attached from most hardware stores. Monitored security systems and their signs are also a huge deterrent. Actually it’s the signs that scare off the bad guys. Actually the average response time of police to a 911 call in the U.S. is 10 minutes, if they come at all to a house alarm. In cities like Los Angeles or Salt Lake police won’t respond to home alarms unless they have an eye witness like a private security company. In an SHTF event, more often than not the best course of action is to shelter in place, unless like in the case of a storm or other emergency where competent governmental agencies have called for an evacuation. If after such an event, a real and legitimate government has not been reestablished in the area, you may need to defend borders until such time as it has been reestablished. In that case, what you have or more accurately what people think you have can make you a target. 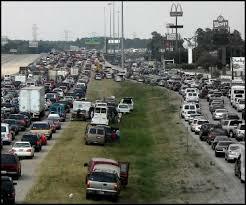 In an urban area your greatest threat is the rest of the starving, sick and scared population. Another thing about an urban area is the plethora of resources in a post TEOTWAWKI event. While there is game to hunt in the country, in the city and surrounding area there are rail yards, steel plants, lumber yards, warehouses, cold storage, dry storage and many other places, even national guard armories in a post apocalyptic world. 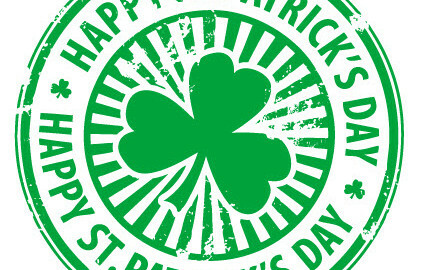 Since this week is Saint Patrick’s Day, I thought what better topic than the creation of alcohol for this week’s post. I’ve been making beer for about 4 years and there are hundreds if not thousands of books on the subject not to mention blogs that specialize in it, magazines, news groups, local and national societies, and a lot of competitions. The purpose of this article isn’t to make you a brew-master, but to give you the basic knowledge to brew beer or wine or distill spirits as a means of trade in a post SHTF society. 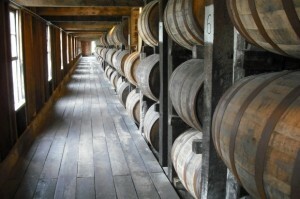 First a disclaimer… the distillation of spirits in the United States is illegal without a license. However, beer and wine can be made without a license for personal consumption. Laws governing beer and wine production vary by state and if interested, you should find out the laws for your specific state. 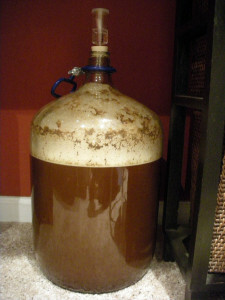 When making alcoholic beverages, you need to start with a fermentable base. For beer, generally use a barley or barley/wheat base; for wine, a fruit base; mead, use honey and for spirits use vegetables. There are hundreds of recipes available on the internet for free, so it’s beyond the scope of this article to act as a recipe, but more as a blueprint. When beginning your beer brew, the starch must be removed from the base. If you are using grain it must be malted and cracked. It is then soaked in hot (175-180 degree) water to release the sugar. Use 1 quart of water for each pound of grain, adding the grain to the water will cool it to about 150-155 degrees and that temperature should be maintained for an hour. The water should be collected in your boil pot, the grain should then be sparged or rinsed with 170 degree water to collect any remaining sugar. The previous steps can be forgone if you use a malt extract instead of the all-grain. 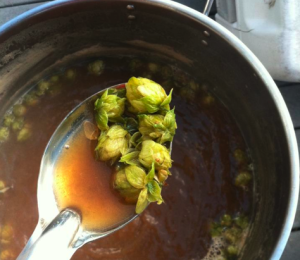 Boil the resulting liquid for an hour adding hops at different times depending on your recipe. Following the boil, cool the liquid (wort) below 80 degrees as quickly as possible. The wort is susceptible to contamination below 180 degrees so great care must be taken until the yeast has taken hold. The wort will kill the yeast if it is too hot when it is pitched and should be under 80 degrees when this happens. After pitching the yeast the wort is sealed in an airtight fermenting container that has a one-way vent. As the yeast eats the sugar the byproducts are alcohol and carbon dioxide, if the fermenter isn’t vented it will pop and could explode. It should be stored in a dark cool closet for 2 to 3 weeks while it ferments. Use about 4 ounces of corn sugar in about a cup of boiling water for 5 gallons of beer, combine in a bottling bucket and pour into bottles and cap with oxygen absorbing bottle caps. After 2-3 weeks your beer is ready to drink. 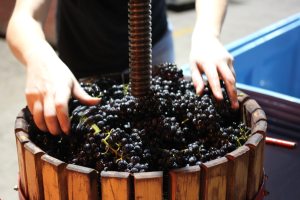 When making wine, you generally use grapes, like with beer you generally use barley. Red wine is made with the pulp and skin of the grape resulting in the red color. White wine is made from the juice from the grape. A stronger strain of yeast is required to withstand the higher alcohol content of wine. It is then fermented for 10 days to a month or more. Fermentation will continue until all the sugar is gone resulting in a dry wine. Many home brewers either use sodium bisulfate to try and stop the fermentation process for a sweeter wine, or let it finish fermenting and then use potassium sorbate and add a sugar solution to sweeten it. Making liquor or spirits, the fermentation process Is basically the same as beer or wine, what sets it apart is the distilling process. As the mash ferments it becomes a wash at 10-12% ethanol, it is then moved into the pot where it is heated to boiling. The boiling point f or ethanol is 172 degrees while the boiling point for water is 212 degrees. 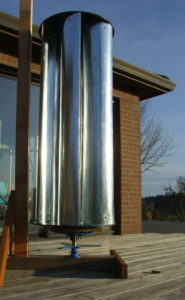 The combined water and alcohol vapor rises into the distillation column, at the top of the distillation column is the lyne arm. The secret to the lyne arm is heat, too much heat and there will be excess water vapor, but not enough heat and there won’t be quality alcohol vapors. 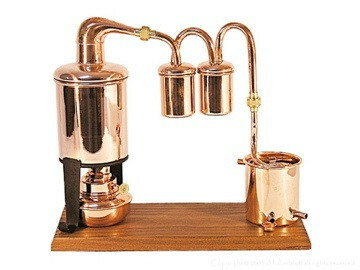 The lyne arm is attached to the condensation coil where the alcohol vapor condenses into your distillate and collects in the collecting vessel. The first 5% of the run is called the foreshots or the heads and contains large amounts of volatile chemicals such as ethers and acetone. Next comes the hearts, where the high alcohol content is located, last is the tails that is low in alcohol content and is generally set aside and redistilled later. The hearts are combined with some of the heads, diluted and aged for the final product. Before aging it is colorless and considered moonshine, however it’s harsh tasting, but aging in a wooden cask will mellow the taste and darken the color. 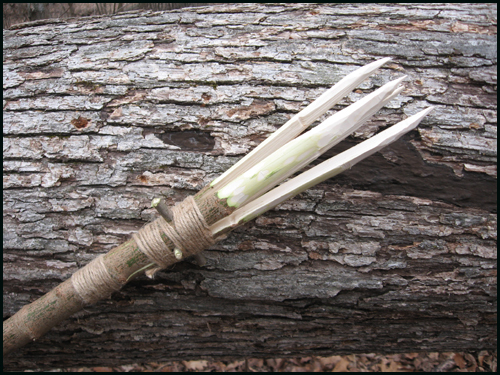 This week we’re going to cover some bushcraft basics. Knowing an approximate time of day or night is a useful ability when hiking, camping or working outdoors. When out in the wilderness you should always have a compass, but if it should become lost or broken, knowing how to find your way is pretty important. We’ll begin with some global facts. Both the sun and moon rise in the east and set in the west. In the northern hemisphere they track through the southern portion of the sky and in the southern hemisphere the reverse is true. In the mid latitudes of the northern hemisphere during the summer there is approximately 14 hours of daylight and 10 hours of dark; while in the winter there is 10 hours of daylight to 14 hours of dark. 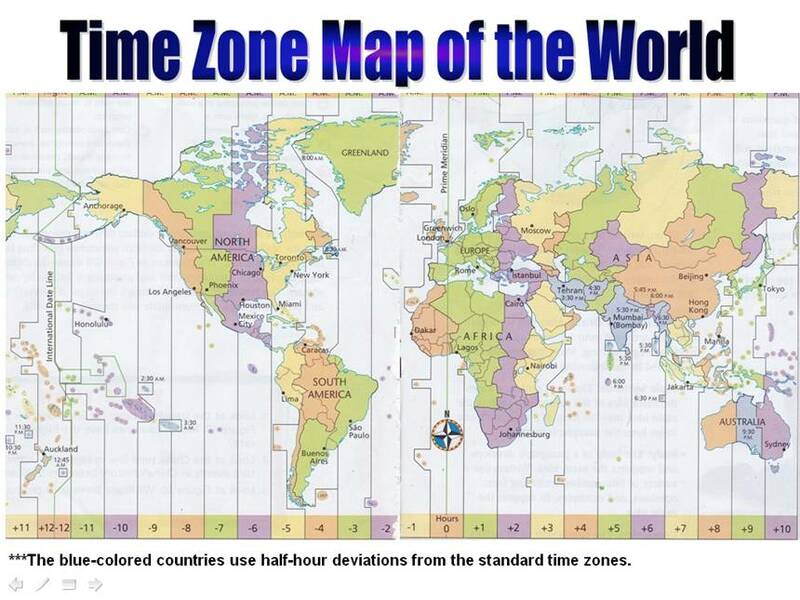 The southern hemisphere is exactly the opposite from the northern and around the equator it is basically 12 hours of each all year long extending to the mid-latitudes in the spring and fall. Noon or “high noon” occurs at the high point of the sun tracking through the sky if you live in the center of your time-zone and it isn’t daylight savings time. As an example, in Chicago in the summertime noon would occur 30 minutes prior to the sun reaching its zenith. 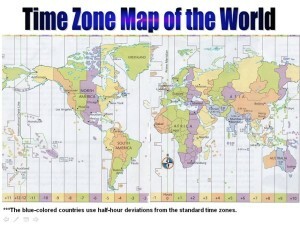 Add an hour for daylight savings time and subtract 30 minutes because Chicago is on the eastern side of its time zone. Therefore the sun would actually zenith at 12:30 pm. Knowing when noon is and what part of the year we are in allows us to divide the sky into segments, between 5 and 7 on each side of the zenith depending on the season. 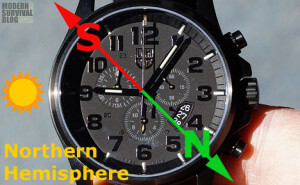 So if you have a compass but no watch you can tell the time by the suns position. If you have a watch but no compass point the hour hand at the sun then put a blade of grass or small twig across the watch halfway between the 12 o’clock position and the hour hand; in the northern hemisphere the half way position is south and the opposite end is north, the opposite is true in the southern hemisphere. Another useful thing to be able to estimate is the amount of daylight remaining. 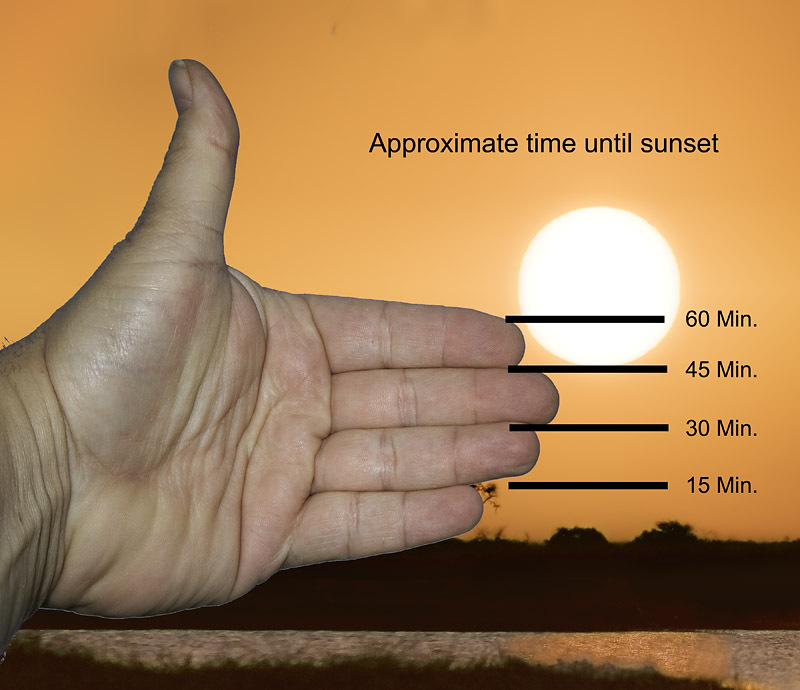 As the sun begins to get close to the horizon, hold your hand sideways at arms length with the fingers parallel to the horizon, each finger width between the sun and the horizon represents approximately 15 minutes until sunset. All of the methods above can be duplicated at night with a full moon. It’s when the moon isn’t full that things become a bit complicated. 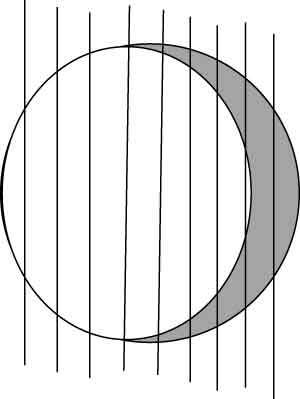 Look at the phase of the moon and divide the circle of the moon by the number of segments of hours in the night. 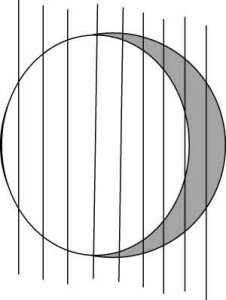 For example in the summer divide by 10 in winter 14, counting from the right side the number of dark segments tells how many hours before sunrise the moon will set in the case of a waning moon. In the case of a waxing moon it tells how many hours after sunset the moon will rise. By knowing what time the moon will rise and set allows us to know when the moon will be at zenith thus directly south in the northern hemisphere. So in the case of the moon graphic, on a summer night, the moon is divided into 10 increments, the dark portion is 2 increments therefore the moon will set 2 hours before sunrise. In this case, sunrise corrected for daylight savings time would be approximately 6:00 am and sunset would be 8:00 pm, moonrise would be 2 hours before sunset and moonset would be 2 hours before sunrise, or moonrise at 4:00 pm and moonset at 4 am. Therefore the moon would be at zenith at 10:00 pm, or directly south in the northern hemisphere.